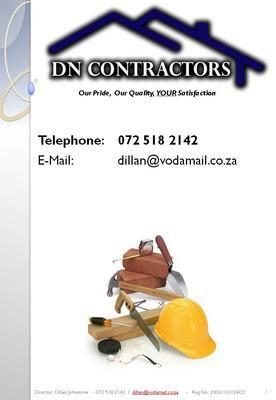 DN Contractors was founded and established in 2002. We are committed to quality control and customer satisfaction. Our values are integrity, trust, ingenuity and high performance. rafted end product that meets our client's exact requirements professionally, exactly as YOU want it done, comfortably within budget, and always on time. 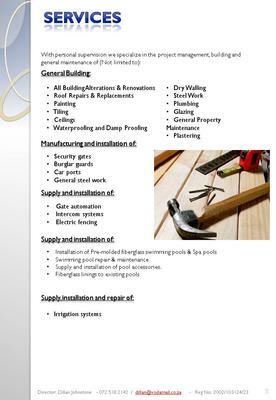 Our focus is the provision of a total building service to you from inception to successful completion of your building project. 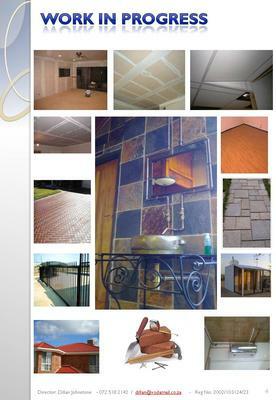 Whether you want to build, renovate or extend. 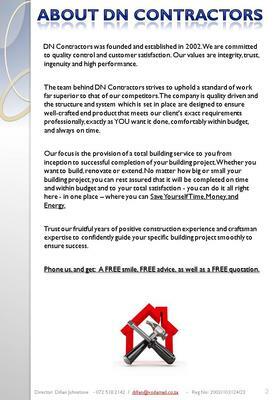 No matter how big or small your building project, you can rest assured that it will be completed on time and within budget and to your total satisfaction - you can do it all right here - in one place – where you can Save Yourself Time, Money, and Energy. Trust our fruitful years of positive construction experience and craftsman expertise to confidently guide your specific building project smoothly to ensure success. Phone us, and get: A FREE smile, FREE advice, as well as a FREE quotation. Supply and installation of pool accessories.